Is the American Eskimo Dog (Standard) right for you? Find your perfect match now! American Eskimo Dogs are neither from the United States nor of indigenous Arctic origin. “Eskimo” was part of the name of a kennel that bred them. This dog hails from Germany, but in the wake of the first World War, American breeders changed the name to something less controversial. American Eskimo Dogs worked as tightrope walkers in American circuses at the beginning of the 20th century; now they're more likely to keep an eye on your kids and your homestead. This is a highly intelligent, moderate-energy, and medium-sized breed. Standard American Eskimo Dogs can grow to between 25-35 pounds and live 12-16 years. The breed was recognized by the American Kennel Club in 1994 and is classified as a member of the Non-Sporting breed group. WHAT IS A STANDARD AMERICAN ESKIMO DOG'S PERSONALITY LIKE? American Eskimo Dogs make friendly companions and lively, eager play partners. Active, fearless, and intrepid, this dog will keep you on your toes. They're usually obedient and make for bright, well-mannered companions. American Eskimo Dogs get along well with children and other pets, including dogs. WHAT IS STANDARD AMERICAN ESKIMO DOG BEHAVIOR LIKE? American Eskimo Dogs belong to you and you alone, happy to jog along at your side or curl up with you on the couch. They can be wary of strangers and don't always understand why you'd need another pet (canine, feline, or otherwise). 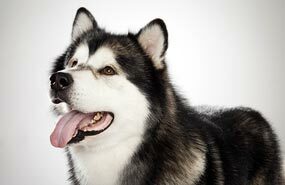 This breed makes for vigilant watchdogs, though they won't be very protective of you or your home. Standard American Eskimo Dogs require daily long walks or chances to run. Most make for good dog park citizens. It's also important to keep their sharp minds active, so teach them tricks and play games together. HOW EASY IS IT TO TRAIN A STANDARD AMERICAN ESKIMO DOG? This is a trainable breed, and they're fast learners, but American Eskimo Dogs of all sizes know their own minds. Start early and be patient and consistent; they respond to training that uses treats and games as rewards. Socialize them young to help them acclimate to new people. They can be somewhat prone to barking; you'll want to nip this behavior in the pup (er, bud). HOW MUCH DO STANDARD AMERICAN ESKIMO DOGS SHED AND WHAT ARE THEIR GROOMING NEEDS? 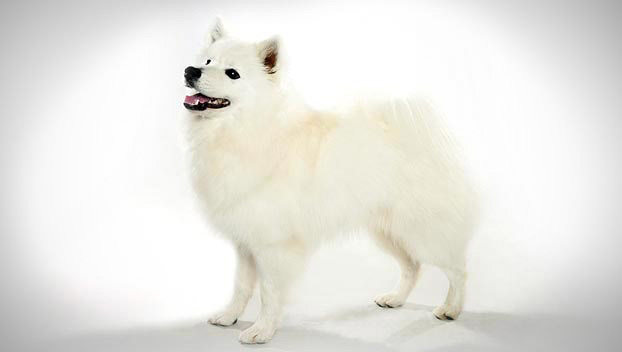 American Eskimo Dogs' harsh outer fur conceals a soft, dense undercoat. Their winter-proof coats are great in chilly weather, but they can overheat in the summer months. These fluffballs are above-average seasonal shedders, and should be combed and brushed at least twice a week to keep their dense coats from matting. (Regularly check the fur around their tushes, too — they sometimes need help in the hygiene department.) But if you keep up with brushing and combing them, they shouldn't require frequent professional grooming. WHAT HEALTH PROBLEMS DO STANDARD AMERICAN ESKIMO DOGS HAVE? These are fairly healthy dogs, but do keep an eye out for slipping kneecaps, hip dysplasia, and eye problems in adult American Eskimo Dogs. Diabetes may also be an issue. ARE STANDARD AMERICAN ESKIMO DOGS GOOD FOR PEOPLE WITH ALLERGIES? The American Kennel Club doesn't list American Eskimo Dogs among its breeds recommended for folks with allergies. You can reduce your furry friend's impact on your allergies with frequent baths and brushings to reduce loose hairs and aggravating proteins in your pet's dander. Use a damp cloth to wipe off your dog after you've been playing outside. Smaller dogs have less surface area, and so produce comparatively less dander than larger breeds — definitely something to keep in mind when you're deciding which size American Eskimo Dog might be right for you and your family! Remember that no breed is 100% hypoallergenic, and any breed can aggravate allergies. WHAT IS A STANDARD AMERICAN ESKIMO DOG'S BEST DAY? Get out before the day warms up and your Miniature American Eskimo will be right there with you. After breakfast (or even during), practice your puzzles and tricks with her to get her mind active and engaged. Of course, don't forget to challenge those tightrope-level agility skills. While yours may not appreciate an actual tightrope, American Eskimo Dogs have been known to excel at musical canine freestyle, so get those dancing shoes on. SHOULD I ADOPT A STANDARD AMERICAN ESKIMO DOG? But if you're in Minnesota, in search of a distinctive-looking, playful pet who wants to romp in the cold with your kids and then sit at your feet while you all warm up, the American Eskimo Dog might be your snow angel. Have you decided that a Standard American Eskimo Dog is the perfect dog for you? Why not be your new best friend's hero and adopt a rescue! Be sure to check out our article on what to expect when you're adopting a dog or cat.